BBC Radio 1 presenter Chris Moyles has apologised after swearing live on air at one of his listeners on Monday. The DJ made the outburst while teasing a mother-of-three from Newcastle during an on-air feature which her children had interrupted. "You've got three kids from some f******...." he blurted out, before apologising profusely for his mistake. The BBC issued an apology, adding that such "slips" could occur during live broadcasts such as Moyles' show. The Leeds-born presenter, who is known for his abrasive on-air persona, began by telling Donna to "shut your face" when she asked if she could visit his house. "I'm so sorry. I do apologise. And I never use bad language," said Moyles immediately. "You can definitely come round and wash my mouth out with soap and water," he added. "Donna, my sincere apologies again. I love you dearly and you can come round for tea any time. "I'm sorry, I'm sorry, I'm sorry, I'm sorry, I'm sorry, I'm sorry. Now let's go home!" Donna laughed the incident off, while Moyles later joked that they were raising money for a sick child by having a swear box after another contestant in his regular Beep Beep Busters quiz made a comment about the incident. 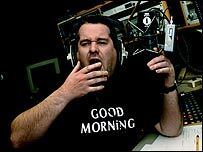 Sir Elton John turned the air blue on Moyles's show in November 2004 when he came out with a tirade of swear words. The BBC was later cleared by broadcasting regulator Ofcom over the incident.